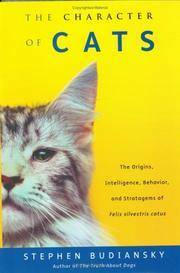 The Character of Cats: The Origins, Intelligence, Behavior and Stratagems of Felis silvestris catus. 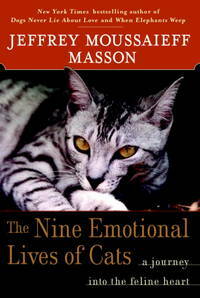 The Nine Emotional Lives of Cats: A Journey Into the Feline Heart. New York: Ballantine Books, 2002. First Edition, First Printing 1/4 cloth AS NEW in AS NEW DJ 8vo2), 259 pp including Index, Recommended Reading, and Notes. Hardbound book is UNREAD, UNMARKED, and AS NEW in pictorial AS NEW DJ. (h) If you own or like cats, there's a lot learn in this book. We own three and have done behavioral work at zoos with big ones, yet there were quite a few "Oh, so THAT'S why he did that" moments in this book. 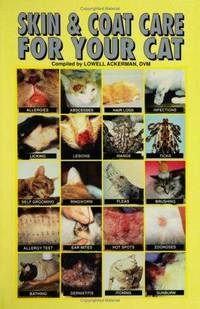 Skin and Coat Care for Your Cat. Neptune City, NJ: TFH Publications, 1996. First Edition, First Printing Laminated Glossy Pictorial Cover NEW / AS NEW 4to (7 x 10-14), 158 pp including Index, Appendices listing American College of Veterinary Dermatology Diplomates in various cities and states and locations (City, State, Address, Phone Number) of Veterinary Dermatology Referral Centers. Book is NEW / AS NEW, unmarked in glossy laminated pictorial covers -- in gift-giving condition. Chapters include detailed diagnoses and treament suggestions for fles, ticks, mange, bacterial and viral skin infections, ringworm and other fungal infections, allergic problems, hair loss, environmental causes of skin problems, lumps, bumps, zoonotic conditions, abcesses, licking, lesions, ear mites, hot spots, sunburn, and a guide to medications. Cats can suffer a variety of skin problems, and -- as a provider for three in-house and two feral cats -- I can vouch for the cost of having to go to a vet for each one -- it's a lot. Cats develop abcesses and itches with easy frequency. The ability to find out if you can take care of it inexpensively and at home can be a huge savings. (h) A comprehensive work.